Often called the Tasmanian Tiger or Tasmanian Wolf, the Thylacine was the largest carnivorous marsupial of modern times. It looked like a dog with stripes and short legs. However, despite its appearance it was not related to canines or felines. Fossil records show the modern Thylacine living at least 4 million years ago in Australia, Tasmania and New Guinea. Thylacine disappeared from Australia after dingos, a more efficient predator arrived about 4000 years ago. By the time of the white colonization, they were only found in Tasmania. Male Thylacines were the size of large dogs. The female were slightly smaller. Both had an abdominal pouch and a stiff tail similar to a kangaroo. They were not fast runners, but could hop like a kangaroo. The litters of two to three pups were carried in the mother’s pouch for three months. 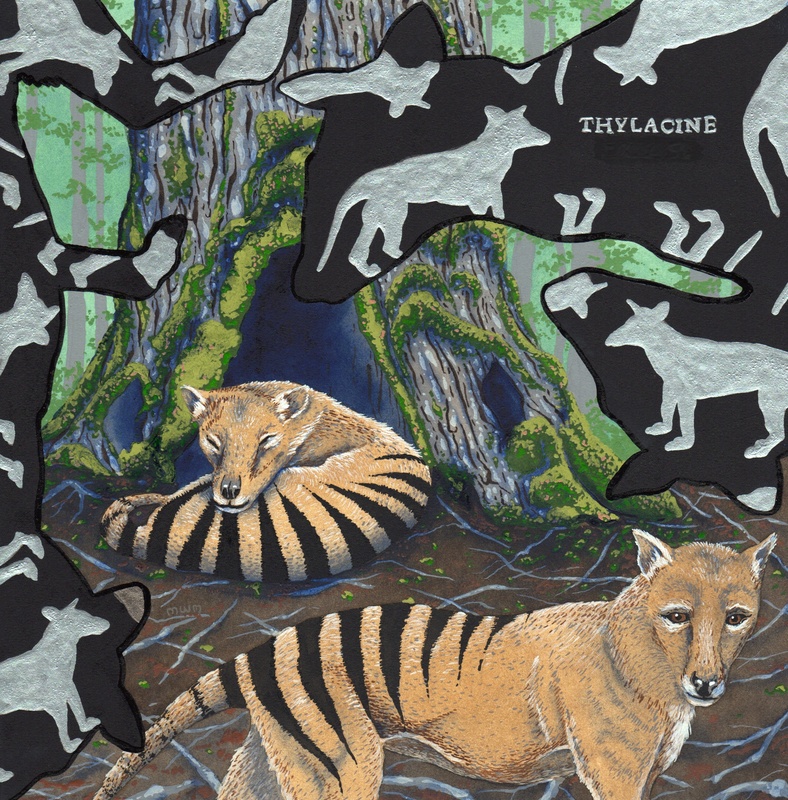 The Thylacine was nocturnal and exclusively carnivorous, hunting mammals and birds. European settlers believing them to be responsible for the loss of sheep and poultry, called for a bounty to eliminate them. Evidence shows these beliefs were exaggerated and sometimes based on manufactured evidence. The increased bounty hunting along with the loss of prey and habitat due to the spread of agriculture lead to their extinction. While the last captive animal died in 1936 (ironically the same year they were granted protection) there were possible sightings of the animal in Tasmania for many years and the Thylacine was not officially declared extinct until 1986.